The skein of Handmaiden Cashmere and Silk was getting smaller and smaller, so I decided today to keep on knitting until the Branching Out scarf was finished. That took a bit more time than I thought, I thought I could do another 3 repeats, but I have knitted 12 more repeats out of that tiny little ball. But now it’s done. I had to unrip my cast off edge two times, because it was too tight. The third time I used a 5 mm needle to cast off (worked the rest of the scarf in 4 mm) and that fixed the problem. The scarf is long enough to wrap around my neck one time. Maybe it will even grow a bit longer after blocking. 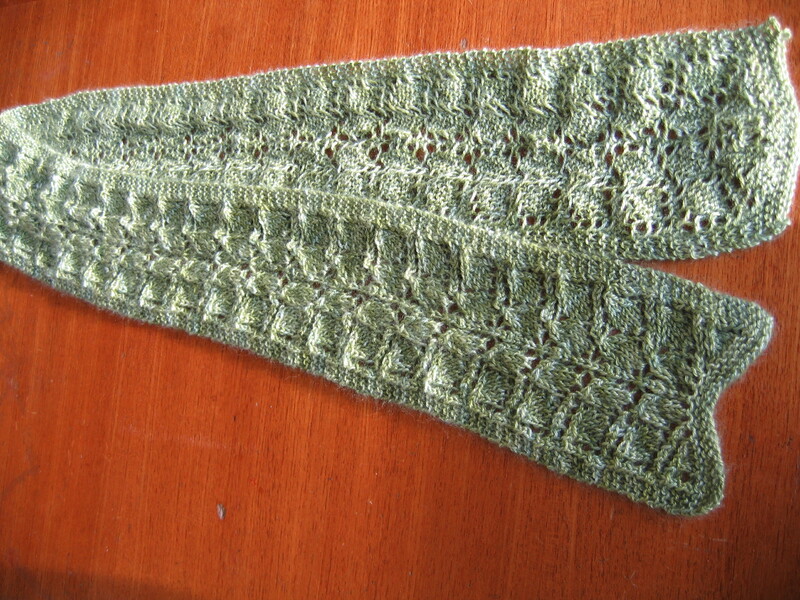 I have never blocked a lace shawl before, I am very curious. But it will have to wait until next weekend. I am very glad I am getting rid of those old WIP’s. I now only have Willow left (and another lace shawl in hibernation but that doesn’t count), but I think that one will be nice to work at in spring. The rest of my WIP’s I have all started in autumn or winter, so I am in no hurry to finish them. I am a bit unsure about Ambleside. Maybe it’s better to frog the part I have done and start again at the recommended gauge. It will be tight this way, maybe it works out, but it could also be irritating not to be able to wear much under it. I am also having problems with the big cables. When I work them, they make the whole knitting very tight, it is almost impossible to knit the stitches from the cable needle. Maybe a less tight gauge would help with that too. I just don’t like ripping out 30 cm’s, although this yarn knits up quite quickly. I read the review by Clara Parkes of the British Sheep Breeds yarn, and she writes it will bloom when you wash it. So maybe that it will look less loosely knitted when you’ve washed it. I think I will have to frog, but: next weekend. I have to get used to the idea first.